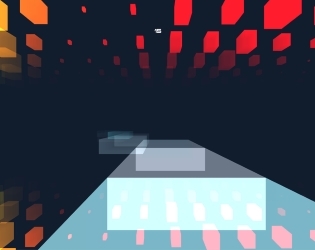 This game was made while investigating audio spectrum analysis on Unity. It was very fun to watch things bounce and change shape with audio. Then I decided to make a game of it. Eventually it became a medicore runner jumper game. Just run to the void of endless audio spectrum space and let your name live in the highscore table! You may unlock new music if you are good runner. Play it on GameJolt to save your highscore and earn trophies! Left-Right: Left-Right arrow or A-D keys. Can be played with gamepad too, just find your buttons.